Austin Therapist: Cross Creek Hospital - Therapist 78754. Send A Message To Cross Creek Hospital. 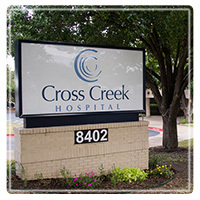 Located in Austin, Texas, Cross Creek Hospital is a pioneering provider of comprehensive services for youth and adults grappling with mental, emotional, behavioral, and substance use concerns. In choosing to come to this hospital for care, individuals can expect to benefit from fully personalized treatment planning that is structured to identify and treat each person's needs. For those who are in need of more intensive and structured programming, Cross Creek Hospital supplies world class inpatient treatment for children, adolescents, adults, and senior adults. Inpatient care at this hospital is separated by age, as the facets of care available are meant to treat the specific concerns of each person. Children between the ages of 5 and 12 can partake in Cross Creek's children's inpatient program. Teens between the ages of 13 and 17 can receive treatment in the adolescent inpatient program. And adults and senior adults can benefit from specialized, age-specific care as well. While in inpatient programming, the unmanaged and distressing symptoms of depression, bipolar disorder, anxiety disorders, and other such concerns can be effectively alleviated so that true healing can be experienced. Furthermore, Individuals in their respective inpatient programs enjoy a blend of time-tested therapeutic interventions, such as individual, group, and family therapies, as well as medication management services as a means of truly alleviating their strife. Additionally, Cross Creek Hospital offers an adult detox program and post-detox rehab services for men and women ages 18 and older who are looking to overcome addictions to heroin, alcohol, meth, prescription drugs, and more. While receiving these services, adults are offered around-the-clock support and are treated by expertly trained medical staff and other highly qualified professionals who want nothing more than to see men and women reach their recovery goals. After completing medically monitored detox, adults can then participate in several therapies that are implemented to help them understand what led them to abuse substances and develop skills for living a sober lifestyle. When finished with both of these services, men and women can then engage in the outpatient treatment that is offered at Cross Creek Hospital. Cross Creek is also pleased to offer an adult chemical dependency intensive outpatient program, or IOP. This program can be used as a step-down level of care or as an introduction to substance abuse treatment. Depending on the needs of the person, certain therapeutic supports will be recommended so that an individual's recovery skills can be enhanced and built upon, serving the person well for a lifetime. Finally, Cross Creek Hospital supplies a mental health partial hospitalization program, or PHP, for adults grappling with emotional and mental health concerns. This invaluable level of care can be started after completing inpatient treatment or offer the services needed that cannot be accessed in less intensive outpatient services. To learn more about the transformative services available at Cross Creek, or to begin the admissions process, contact this hospital today. In doing so, you or an important person in your life can become healthier in mind and body once more.